The cows are just East of the house right now. They finished up grazing the primary stockpiled ground further East and I needed somewhere to go with them. Really, they should be North of the house in the bottom where the grass is 10-12 inches tall and still green (somehow). But that’s a long way to drag a hose. 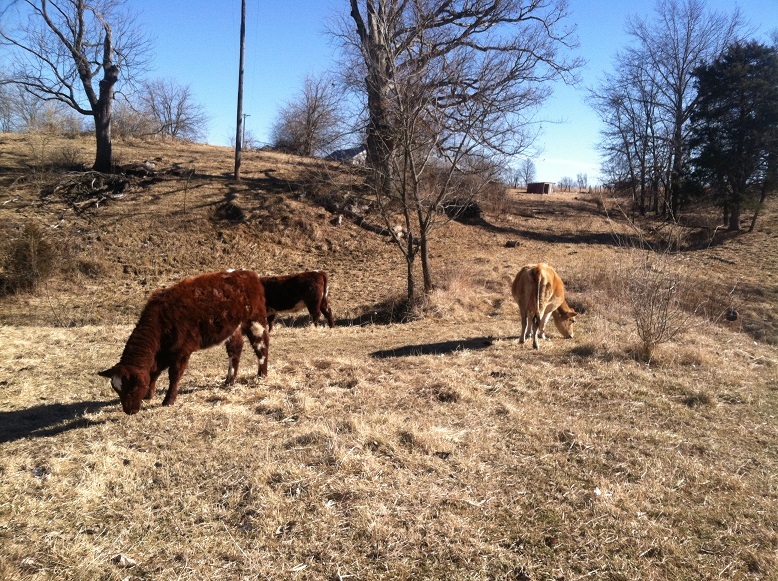 East and South of the house lies the remains of pasture that the cows passed over in October. Forages they just elected to skip. Lots of fescue. There is a fair amount of grass there but it is only marginal in quality…at best. I am offering large grazing areas and two whole bales of hay each day. This is mostly a South-facing slope that will start recovering mid-February and will really be ready to graze again in March. Certainly by St. Patrick’s day. But right now it has bunches of fescue and tall stalks from chickory and other forages. Mixed in are a few thorny saplings that I need to manage. If I do this right, the cows will crop it all close, add nearly a ton of manure and expose the thorny trees so I can deal with them. 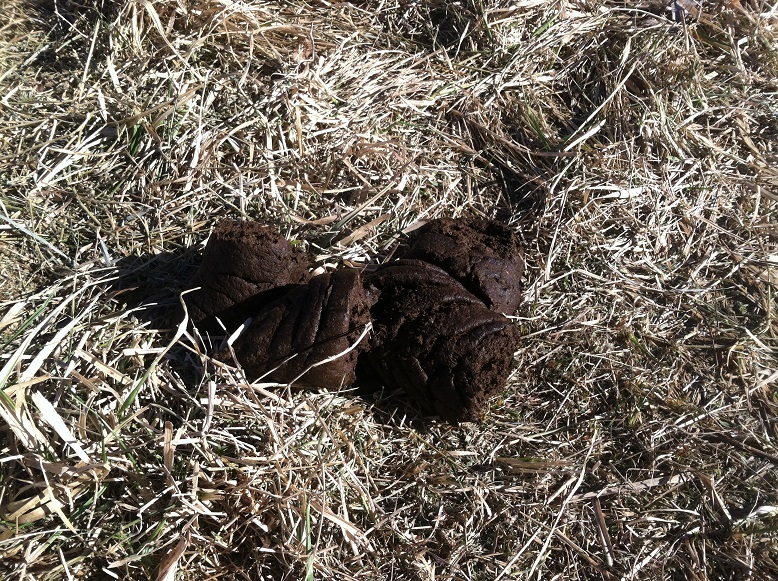 Speaking of fertility, I have to keep an eye on their manure. Yes, every day I look at cow manure. This is looking too dry and stiff. I need to up the protein in their diet. For now I’m calibrating it with alfalfa hay but as we graze our way North I may need to do a little more for them. The pasture to the North is tall, dry, brown bermudagrass. I’m sure it’s about as delicious as straw and will require protein supplementation for digestion. The slope they are on sheltered them from NW winds above 45 mph Sunday night and a wind chill toward -20. That’s quite a change from Sunday’s high temperature of 50 degrees that left several of the cows panting in the heat. I still have a few acres of stockpiled fescue but, for now, we’re going to ask the cows to do their best with this stuff. I’ll have to keep an eye on things. As a note to myself in this public diary, Flora came up with a limp in her rear left on Saturday morning. Picture #2 above shows her standing with weight off of that hoof. 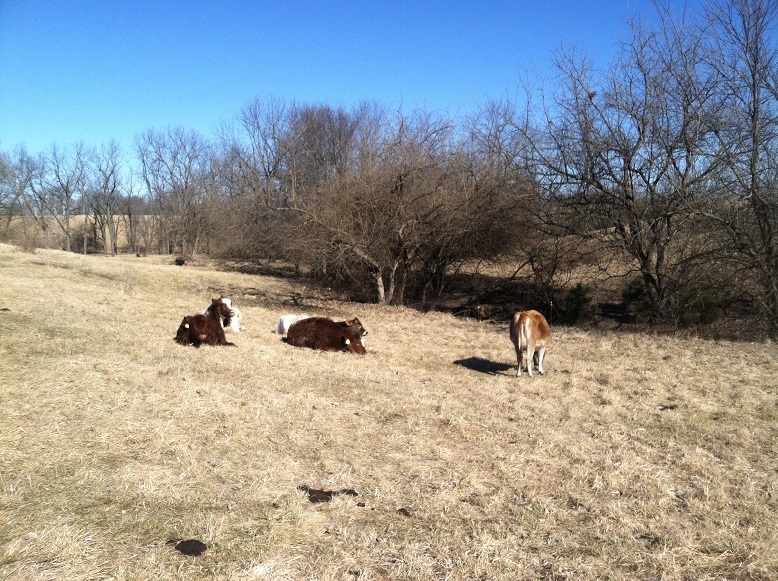 The cows had been in the hickory grove. I suspect she either slipped on ice or she has a thorn in her hoof. Sunday it was less pronounced. Monday it was still there but less so. I’ll try to catch her Tuesday morning and check out that hoof. Thanks for the continual view of grazing. It gives more and more details each time. The paper here yesterday said that cattlemen are selling their herds because they can’t afford hay and feed. We are in an officially declared drought, which means the lack of water has been here for a while and the govt. just decided to make it official now. I’m assuming the Midwest has that issue, correct? Well, you do live in a brittle environment. Our pond is a little low but we’re doing OK. However, I am afraid modern agricultural practices are making us more drought-prone, even here. I’m watching my neighbors tile every field to drain off spring rains and open the fields earlier in the year. That works until it doesn’t. At some point they may want to hold a little moisture. But since we have tiled the world we quickly funnel rain water into the streams and out into the rivers…causing floods and dry beds at intervals since there is nothing to trickle out slowly. Blowing dust has just become a problem around here. I suspect fall field work along with tiling can go hand in hand to collect blame along with the lack of rain. Didn’t these guys study history in school?